Katie: The Oxo Tower is part of the highly exclusive Harvey Nichols family, and is an iconic, 'where to be seen' hot spot. The Oxo Tower is also a prominent member of the London Skyline especially at night when the 'Oxo' is lit up in red. The Oxo Tower is located in central London between the South Bank of the River Thames and between Blackfriars Bridge and Waterloo Bridge. Due to the fabulous location of the Oxo Tower views that diners are treated to are amongst the very best in the city, which only adds to the over all satisfaction of the experience- as both myself and Chelsie can testify. Chelsie: As our readers know I love Afternoon Tea. The vast array of teas, delicate sandwiches and mouthwatering top tier of cakes makes for a great experience; but sometimes (and I hope i'm not in the minority here) you just fancy something a little different. The Oxo Tower Brassiere has the solution to this- Not Afternoon Tea. Intrigued? So were we! Not Afternoon Tea is your choice of a themed pudding (essentially the top layer of the afternoon tea) and a choice of cocktail. 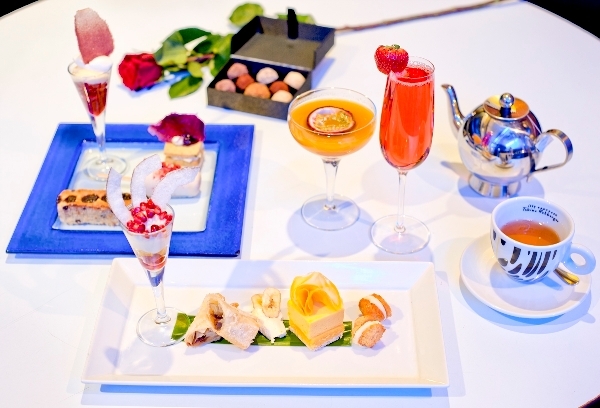 This take on afternoon tea is pure indulgence. Katie and I visited in August 2011, and this was our first visit to The Oxo Tower and we were so excited! The decor inside the tower is much like the other parts of Harvey Nichols we had visited, immaculate, modern decor everywhere and a warm welcome from staff. Our waiter showed us to our table, and unfortunately due to England's sometimes temperamental weather we sat inside rather then outside. This however and I must make note did not adversely effect our views, and the views were fantastic. Katie: After much deliberation (the options all looked so good!) we both selected Taywell Preserved. This consisted of a white chocolate strawberry lolly (Literally to die for, our favourite hands down), cherry, rum and chocolate frangipani, blueberry jam, pistachio shortbread and finally a clotted cream tayberry and vodka trifle. The service was extremely prompt, and within a short space of time we had our beautifully presented plate of luxury. Chelsie and I would highly recommend this, both the food and surroundings are worth every penny. This highly indulgent alternative to traditional tea, Chelsie and I believe would be perfect for a few hours out with friends, a birthday treat, or simply because! The menu at The Oxo Tower Brassiere Not Afternoon Tea has since changed since our last visit, so we have included the new details below. Trust us if it was anything like our experience you will really enjoy it! The Not Afternoon Tea will be available daily as of 9th January 2012.